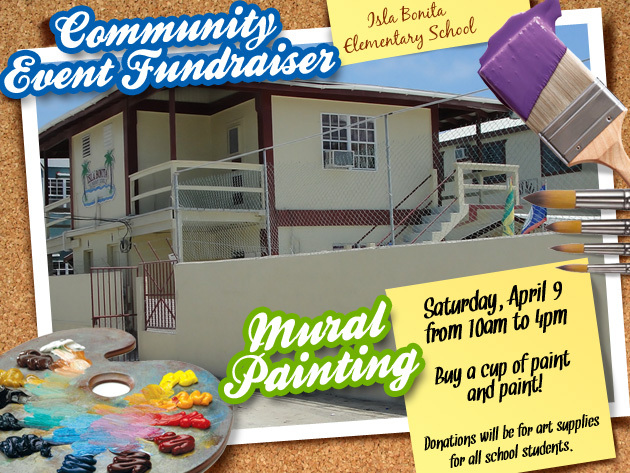 On Saturday April 9, Isla Bonita Elementary School will be holding a community event/fundraiser. Students and the entire community are invited to the school between the hours of 10am and 4pm to participate in the painting of a mural on school property. All those wanting to participate in painting the mural can buy a cup of paint. All donations collected will go to buying classroom art supplies available to all the students. The project is being organized by volunteer Arts and P.E. Teacher Natalie Burk. Natalie has been collecting donations from local businesses, but would greatly appreciate any personal donations in form of paints and paintbrushes. This mural stands as an excellent opportunity to exercise the practical application of the arts, beautify the school, gather the community and raise money for a great cause. Natalie and the staff of Isla Bonita look forward to seeing you on Saturday. *Bar-B-Que, Drinks and Snacks will be on sale!